Some two-and-a-half months have passed since Comrade Kim Jong Un, the leader of the socialist Democratic People’s Republic of Korea (DPRK), held his unprecedented meeting with his US counterpart, Donald J Trump in Singapore on 12 June. Since that time, no further fundamental changes have occurred in the bilateral relations between the two countries. The follow-on negotiations, to be led on the US side by Secretary of State Mike Pompeo, and to which the two leaders committed themselves in their joint statement, have proceeded in a fitful fashion, whilst the DPRK has continued to strengthen its cooperative ties with south Korea, China, Russia and other countries. A third visit to Pyongyang by Pompeo in the first week of July failed to yield any concrete results and, following his departure, the DPRK accused him of presenting a set of “gangster-like” demands. Although these were not specified, they were widely believed to centre on unilateral acts of disarmament on the part of the DPRK. Indeed, whilst the DPRK has kept to its word, with a number of concrete goodwill gestures, including maintaining a moratorium on nuclear and missile testing, dismantling a number of facilities and repatriating the remains of US Missing in Action (MIA) servicemen, who perished in the Korean War of 1950-53, the US, at least since President Trump made a surprise announcement of a freeze of US-south Korea provocative military exercises during the press conference he gave immediately after the Singapore summit, has singularly failed to take any substantive action to address the DPRK’s key concerns, for example by moving to declare a formal end to the Korean War or to relax or lift sanctions. In fact, the US has continued to pile on the sanctions pressure, principally targeting Russian and Chinese entities said to be engaged in economic cooperation with the DPRK. Despite this, the DPRK has so far continued to absolve President Trump from personal blame or criticism for the impasse in the peace process, preferring to admonish members of his administration for failing to act in accordance with his wishes, a charge that may indeed have some substance. Likewise, President Trump continues to maintain a respectful tone when referring to his DPRK counterpart. However, on Friday 24 August, Trump abruptly cancelled what would have been Pompeo’s fourth visit to Pyongyang, citing what he termed as a lack of progress on denuclearisation by the DPRK. The cancellation came just the day after the visit had been formally announced and shortly after Steve Biegun, a retiring executive with the Ford Motor Company, had been appointed as US special representative for the DPRK, and who would have accompanied Pompeo. However, given Trump’s volatility and impetuosity, it is by no means inconceivable that the trip will be rescheduled in the fairly near future, just as he cancelled and then reinstated his own Singapore summit. Taking to his favourite form of diplomatic communication, namely Twitter, Trump stated: “I have asked Secretary of State Mike Pompeo not to go to North Korea at this time because I feel we are not making sufficient progress with respect to the denuclearization of the Korean Peninsula.” Yet, as recently as the Monday of that week, Trump had claimed, in an interview with the Reuters News Agency, that the DPRK had, in fact, taken steps to denuclearise. “With most analysts expecting the relationship between China and the United States to get worse before it gets better, Mr. Trump has set a high bar for resuming high-level talks with North Korea” (‘Trump asks Pompeo to cancel North Korea trip, pointing to stalled diplomacy’, 24 August 2018). The Financial Times reported: “Mr Kazianis [Harry Kazianis, North Korea expert and director of defence studies at the Center for the National Interest] added that the administration may have decided that pushing for a lasting shift in trade relations with China had now outstripped the risk posed by North Korea’s extensive nuclear weapons programme. The Trump administration has already repeatedly named China as a great power competitor and many senior security officials see Beijing as the greatest long-term threat to the US” (‘Donald Trump cancels Mike Pompeo visit to North Korea’, 24 August 2018). Having struck out at China, Trump concluded: “In the meantime I would like to send my warmest regards and respect to Chairman Kim. I look forward to seeing him soon!” Earlier in the week, Trump had said that a second summit with Kim Jong Un would “most likely” happen. “Victor D. Cha, who negotiated with North Korea for Mr. Bush, said the decision to scrap the trip reflected the White House’s desire not to be boxed in by North Korea’s key demand: that the United States accept a declaration formally ending the Korean War. “In the coming weeks, Mr. Kim is expected to meet with other leaders, including President Xi Jinping of China and President Vladimir V. Putin of Russia — all of whom are likely to throw their support behind a peace treaty. South Korea also favors a move toward peace. The paper continued: “Mr. Trump’s assessment that China is no longer playing a helpful role in squeezing Pyongyang is accurate, analysts said. Since 90 percent of North Korea’s foreign trade goes through China, Beijing’s recalcitrance means the administration cannot return to its policy of ‘maximum pressure,’ which relied on the economic and diplomatic isolation of Pyongyang. “‘The U.S. took the pressure off prematurely and got little or nothing in return,’ said Tom Donilon, who served as national security adviser to Mr. Obama. ‘It will be very difficult to rebuild an effective sanctions pressure campaign – which requires the cooperation of partner countries who have moved on’” (op. cit.). Whilst Pyongyang may be deprived, at least for now, of the dubious pleasure of a further visit from Mike Pompeo, the DPRK’s diplomatic diary is far from empty. “At the high-level inter-Korean meeting held two days ago, it was agreed that the fall inter-Korean summit, as promised in the Panmunjom meeting, will go forward. “When peace is established on the Korean peninsula along with complete denuclearisation, economic cooperation can be carried out in earnest. When the dreams of a peace-based economy and economic community are realised, our economy can take a new leap forward. The day when all Korean people are prosperous together will also be advanced. On 9 September, the DPRK will celebrate the 70th anniversary of its foundation – seven decades in which it has stood in fierce confrontation with US imperialism, without ever retreating from its principled revolutionary and socialist positions. 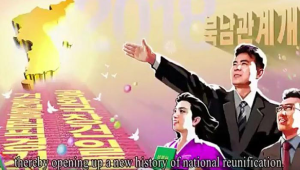 Although it is yet to be confirmed at time of writing, it is widely reported that the chief guest at the huge celebrations that Pyongyang is planning will be Comrade Xi Jinping, Chinese President and General Secretary of the Chinese Communist Party. Kim has already paid three visits to China this year as the guest of Xi. Whatever the complexities of the DPRK’s ongoing struggle against imperialism, one thing is clear – Comrade Kim Jong Un’s resolute stance and diplomatic and political skills have dealt a telling blow to the attempts to isolate his country.